The story of two Italian-born anarchists, Nicola Sacco and Bartolomeo Vanzetti, framed for murder and then executed for their beliefs. "Did you see what I did to those anarchist bastards?" Sacco and Vanzetti (see picture, left) were committed anarchists who had been active in many workers' struggles. In 1916, Sacco was arrested for taking part in a demonstration in solidarity with workers on strike in Minnesota. In the same year he took part in a strike in a factory in Plymouth, Massachusetts. It was here that he met Bartolomeo Vanzetti, who was one of the principal organisers of that strike. Like most anarchists, the two were also active in their opposition to the First World War. Severe poverty in the post-war years meant that many workers were dissatisfied with the status quo. The authorities were terrified that workers might follow the example of the Russian Revolution, and were doing everything in their power to portray communism and anarchism as 'un-American', and to frighten workers way from 'red' propaganda. In April 1920, anarchist Andrea Salsedo was arrested and detained for 8 weeks. On the morning of May 3rd, he 'fell' to his death from the 14th floor window of a New York Dept. of Justice building. Sacco and Vanzetti, along with other comrades, immediately called a public meeting in Boston to protest. While out building support for this meeting they were arrested on suspicion of "dangerous radical activities". They soon found themselves charged with a payroll robbery which had taken place the previous April in which 2 security guards had been killed. The case came to trial in June 1921, and lasted for seven weeks. The state's case against the two was almost non-existent. Twelve of Vanzetti's customers (he was working as a fish seller) testified that he was delivering fish to them at the time of the crime. An official of the Italian Consulate in Boston testified that Sacco had been seeing him about a passport at the time. Furthermore, somebody else confessed to the crime and said that neither Sacco nor Vanzetti had anything to do with it. The judge in the case, Judge Webster Thayer, said of Vanzetti: "This man, although he may not have actually committed the crime attributed to him, is nevertheless morally culpable, because he is the enemy of our existing institutions." The foreman of the jury, a retired policeman, said in response to a friend of his who ventured the opinion that Sacco and Vanzetti might be innocent "Damn them. They ought to hang anyway." Having sentenced the two men to death, the judge boasted to a friend "Did you see what I did to those anarchist bastards the other day"
There was no doubt about the fact that Sacco and Vanzetti were on trial for their political beliefs and that the verdict when it came was a class verdict - the state was delivering a clear message to the US working class - steer well clear of anarchist thought or face the consequences. 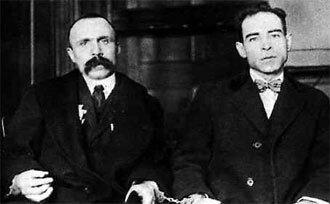 Sacco and Vanzetti were to spend the next six years in prison as appeal after appeal was turned down. Finally, on August 23rd 1927, they were executed. News of the executions sent hundreds of thousands of protestors into the streets all across the world. The US embassy in Paris had to be surrounded by tanks to protect it from an angry crowd of protestors, a riot in London resulted in 40 injuries, the US Consulate in Geneva was surrounded by a 5,000 strong crowd, huge crowds wearing black armbands marched in Boston and New York. Shortly before he was executed, Vanzetti said, "The last moment belongs to us - that agony is our triumph!" It is in remembering the moment of their deaths, and in continuing to fight for their vision of a new, fair society that we honour these men. To commemorate the executions and to renew the commitment to the ideals they fought for, anarchists and labour activists in New York and around the world often hold commemorative events on 23rd August each year. 85 years today since their execution.